Freedom Vote ballot listing the nominees for president, vice president, senator, and second district congressional seat for the Freedom Democratic Party, Democratic Party, and Republican Party. From the Zwerling (Matthew) Freedom Summer Collection. 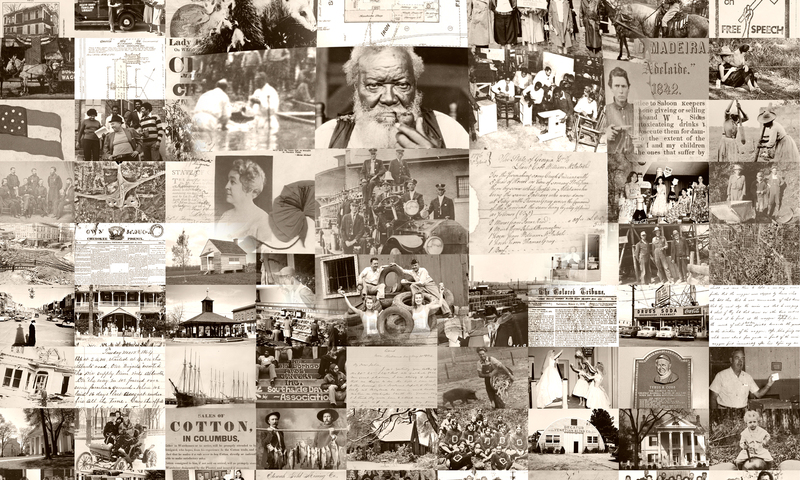 Civil Rights in Mississippi Digital Archive Collection, University of Southern Mississippi. The political convention season of 1964 saw the Mississippi Freedom Democratic Party (MFDP) grow out of voter registration and voting rights projects established by the Council of Federated Organizations (COFO) that same year. A coalition of national, regional, and local civil rights organizations that unified to draw attention to the civil rights crisis in Mississippi, COFO launched the Mississippi Freedom Summer Project in 1964. Freedom Summer was designed to attract national attention to the injustices experienced by African Americans in Mississippi who attempted to exercise their voting rights, and to underscore an acute need for federal legislation in this area–voting rights were not addressed as part of the Civil Rights Act of 1964. Of all of the Southern states, Mississippi had the most powerful citizens groups and state agencies that enforced segregation, and strategies that had previously worked in other Southern civil rights campaigns were rendered ineffective by the intensity of resistance and violence practiced by white citizens councils and local law enforcement officials in rural Mississippi. It was COFO’s hope to appeal to a national network of volunteers, including many white students from the North, who could relocate to Mississippi during their summer break to bolster local efforts at voter registration and education, and help build a sustainable campaign infrastructure that would last after they returned to school. The influx of Freedom Summer students and volunteers in 1964 helped organize 17,000 African American residents of Mississippi to register to vote in 1964; however, only 1,600 of these applications were accepted by local registrars. The segregationist backlash surrounding civil rights activities in Mississippi prior to the 1964 Democratic Convention was widespread. This includes the June 11, 1963 assassination of Medgar Evers, the NAACP’s first Mississippi field secretary, who had helped organize a boycott against white merchants in Jackson, Mississippi (most of whom were White Citizens Council members) and played a key role in the desegregation of the University of Mississippi in 1962; he was shot the same evening that President John F. Kennedy went on television to ask Americans to support the civil rights bill that would become the Civil Rights Act of 1964. On June 21st the following year, three young Freedom Summer organizers (James Chaney, an African American Mississippian, and Andrew Goodman and Michael Schwerner, two white Northerners) disappeared while investigating a church burning in Neshoba County, Tennessee–more than twenty African American churches were firebombed that summer. Six weeks later, their bodies were found buried underneath a dam on a private farm on August 4. Mississippi Freedom Democratic Party campaign button reading “One Man One Vote” and “FDP.” From the M357 Dahl (Kathleen) Freedom Summer Collection. Historical Manuscripts and Photographs Collection, University of Southern Mississippi Digital Collections. Working amidst regular threats of violence, volunteers continued with their voter registration work, and delegates to the 1964 Democratic National Convention in Atlantic City, New Jersey, were elected at MFDP’s state convention in Jackson on August 6, 1964. Because African Americans in Mississippi were denied admittance to state Democratic party meetings, MFDP followed the state Democratic party’s official procedures to the letter and organized parallel caucuses for Mississippi districts and precincts that were open to members of all races. By challenging the segregated delegation sent by Mississippi’s established Democrats at the 1964 Democratic National Convention in Atlantic City, MFDP and COFO had hoped to create enough pressure within the national Democratic party to undermine Mississippi’s discriminatory state election practices. However, despite having built significant public support, MFDP received disappointingly little support from national party officials. In a televised hearing on August 22, sharecropper Fannie Lou Hamer, herself a victim of a life-threatening beating in a Mississippi jail for her civil rights activities, delivered testimony to the Credentials Committee of the Democratic National Convention. Hamer presented a moving account of how she and other African Americans in Mississippi were excluded from the electorate by violent segregationist resistance, and that the all-white Mississippi Democratic Party delegation was being challenged on the grounds that these candidates had been elected unconstitutionally and against party rules by disenfranchising thousands of African Americans. President Lyndon B. Johnson, however, feared losing white Southern political support to national Republican candidate Barry Goldwater if it appeared that MFDP delegates were supported by the national Democratic party, and so he pre-empted Hamer’s television coverage with an emergency press conference of his own. Because Hamer’s testimony was so compelling, many television networks still aired it unedited on their late evening news programs. President Johnson also instructed his staff to manufacture a compromise with the Democratic National Convention’s credentials committee that would save white Southern votes, but also earn MFDP approval. The credentials committee ultimately offered to award the MFDP two at-large seats (but with no power to vote on any issues being discussed on the convention floor); to seat members of the all-white delegation who agreed to sign a written pledge to support the convention’s candidates in the upcoming November elections; and to bar segregated state delegations from the 1968 convention. The credentials committee recommendation was approved in a closed session by a voice vote, which was quickly reported back to the convention floor–only one person in the closed session meeting was permitted to represent MFDP’s interests. Unsurprisingly, the closed session vote failed to satisfy the MFDP or the all-white delegation of segregationist Democrats. Only three members of the all-white delegation signed the pledge to back DNC candidates that upcoming November. MFDP members refused to accept the election of a delegation and a system that denied them their constitutional rights, and many civil rights leaders felt betrayed by the white liberal establishment for not backing the MFDP. After the walk-out of most of Mississippi’s all-white delegation, MFDP delegates seated themselves in their vacated seats on the convention in protest; for several hours, convention security tried to remove MFDP delegates from the seats while members from other state Democratic delegations interceded by blocking the guards from the MFDP delegates. When the vacant seats were ultimately removed by convention organizers the following day, MFDP delegates occupied the space and sung freedom songs. Flyer soliciting support to seat members of the Mississippi Freedom Democratic Party (MFDP) at the 1964 Democratic National Convention. From Box 1, Folder 9, M336 Zwerling (Matthew) Freedom Summer Collection, McCain Library, University of Southern Mississippi. Although the MFDP was not officially recognized at the 1964 convention, its delegate challenge had a tremendous impact on drawing attention to the injustices experienced by disenfranchised African American citizens of Mississippi, and on African American voting rights nationally; in 1965, the Voting Rights Act was passed, and in following years, the Democratic party ensured fair participation and stopped discriminating against African Americans. At the 1968 Democratic convention, MFDP members were seated as delegates to the Democratic National Convention as the Loyal Democrats of Mississippi, and Fannie Lou Hamer was elected as a national Democratic Party delegate for the 1972 national convention in Miami Beach. For further reading and research, the Civil Rights Digital Library provides access to numerous primary resources and educational materials about voting rights, the 1964 Democratic Convention, the Mississippi Freedom Democratic Party, and Freedom Summer.